Do you feel stressed? Are you frustrated with parenting? Would you like more information about available professional services? 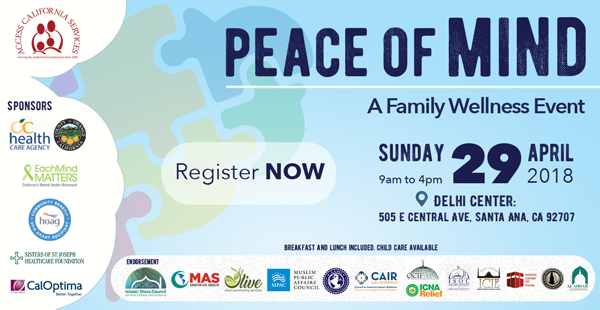 Join #AccessCal and our community professionals on April 29 at Peace of Mind: A Family Wellness Event. Go to www.accesscal.org to register now! 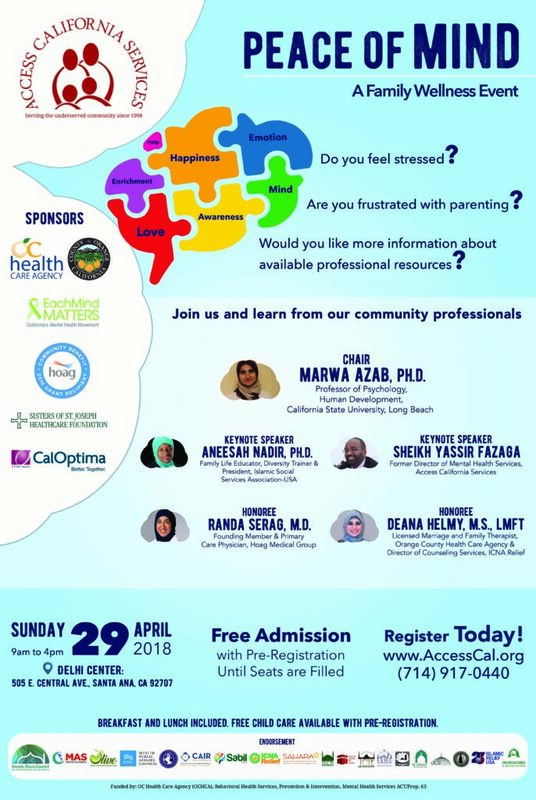 We’re excited to have Marwa Azab, Ph.D. (Professor of Psychology, Human Develop at California State University, Long Beach), Aneesah Nadir, Ph.D (Family Life Educator, Diversity Trainer & President of Islamic Social Services Association-USA), and Sheikh Yassir Fazaga (Former Director of Mental Health Services at Access California Services and President and Founder of Tanweer Institute), speaking at this event! After registering, you can submit questions for our community professionals to answer AND you can win a $100 gift card by submitting a poem or spoken word piece. To find out more, visit www.accesscal.org or www.accesscal.org/peace-of-mind-2018. No entrance fee & free parking – though you MUST register. Breakfast and lunch included. Child care available with pre-registration.